The Gujarat government announced implementation of National Food Security Act (NFSA), 2013 from April 1, 2016, almost two-and-a-half years after it was passed in Parliament. However, in the very first month, the state has shown extremely poor performance, leaving large sections without food grains. Under the NFSA, 75% of the rural households and 58% of the urban households are to be covered for food security in order to provide 5 kg of ration per person for Rs 2 per kg. Every state has to prepare a list of “priority households” as per the inclusive and exclusive criterion, mentioned in the Act. The Gujarat government decided take the socio-economic and caste census (SECC) data of 2011 to prepare the “priority list”, eligible for getting ration under the NFSA. Till mid-March, this list remained a big mystery. After many efforts by RTI activists in Anand, Nadiad, Surendranagar and many other districts, the list of priority households was finally uploaded on the Food and Civil Supplies Department of the Gujarat government in the first week of April. As per the provisions of the Act, Antyoday, below poverty line (BPL), unorganized workers, women headed households, landless labourers, nomadic, denotified and primitive tribes were to be automatically included, and households having government service, with a four-wheeler vehicle and having income more than 1.2 lakh per year were be excluded. The Gujarat government, through its government resolution (GR) dated July 14, 2014 provided details of the criteria with some elaboration. However, the list, as per the SECC 2011 data, excludes a large number of poor families from the inclusive criteria. This has happened because the SECC survey was conducted in a very messy manner. In Dhrangadhra city in Surendranagar district, the issue was taken up by right to information (RTI) activist Saiyyad Imtiyaz, wherein it was revealed that more than 5,500 needy families have been left out without ration. Surprisingly, the state government has not prepared any format for “dava arji form” (claim form) for a request to be included in the list, leading to a situation that the “dava arji” format is being designed according to the whims and fancies of each taluka mamlatdar, a lower level revenue official, known for a very limited understanding of NFSA. In Dhrangadhra, the claim form runs into six pages, in Kutch it is 12 pages, and in Panchmahals it is four pages. The “demands” include affidavits and several documents, which are difficult for the needy and marginalized families to seek. Families from the denotified tribes category from Surendranagar district complained on RTI helpline (run by the NGO Mahiti Adhikar Gujarat Pahel) that they were being asked to produce electricity bill, house tax bill, and a certificate of income from talati (village level revenue official). It a common knowledge that they do not have any of these – they have always stayed make-shift hut-type structures outside villages. The Siddi community from Gir sanctuary, Padhar families of the villages near Nalsarovar, and Kathodia Bhils from Sabarkanth, all of whom fall in the primitive tribes category, have been excluded from the NFSA list of Gujarat, though they entitled for having Antyodaya card as per the guidelines of the Supreme Court. As per the NFSA, the state government should not disturb the Antyodaya (poorest of the poor) list at all. However, many of the existing Antyodaya families have complained that, when they approach the ration shop in April, they were told that their name did not exist on the list. Another big issue of concern is the quantity decided by the the government. As per NFSA provision, the government needs to give rice, wheat and millets, all together 5 kg per person, while the Antyodaya should get a regular ration of 35 kg. The Gujarat government, through its GR dated March 18, 2016, changed this quantity to 5 kg of rice and 30 kg of wheat from 16 kg of rice and 19 kg of wheat. For priority households, it is 4.25 kg of wheat, and just 750 gms of rice per person; the millets have simply vanished. Surprisingly, the GR does not give any provide any background information as to on what basis these drastic changes have been made, affecting people’s food security. As per the provisions of the NFSA, there should be a block-level committee to look into the issue of priority households, and there should be a district-level grievances redressal officer, who is supposed to accept the grievances and should dispose these of as per the provisions of the Act. In Gujarat, these offices are simply refusing to accept the “dava arji” or complaints. Officials are returning the complaints saying, “The list is final and there won’t be any change hence forth”. 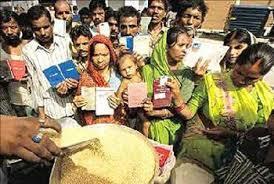 The government had started a helpline for ration card holders -- 18002335500. However, people have complained that it is not working. Worse, no information is shared regarding how many complaints have been registered and how many have been disposed of even district wise or month wise. Thus, there is not transparency and accountability of the helpline, though the state government calls its website “pardarishita portal”. Meanwhile, the RTI helpline over the last one month has received several phone calls from BPL, Antyodaya, nomadic, denotified and premitive tribes, as also workers and single women, complaining that they did not get ration in the month of April, and their names have been not included in the priority list. There is reason to believe: The NFSA has been turned into Food Insecurity Act by the Gujarat government.